When you are expecting, you want to do everything you can to ensure that your baby will be born safe and healthy. Many parents are concerned with potential risks during gestation. Expectant mothers are warned away from potential hazards like sushi, soft cheeses and even the litter box. But where does household pest control methods fit into to pregnancy health? When Should You Be Concerned with Pesticide Exposure? In general, normal pesticide use is considered safe during pregnancy. But in the name of caution, there are times when individuals may wish to limit their pesticide exposure. The first trimester is the most crucial time when it comes to pesticide exposure. During these months, your baby’s nervous system is undergoing rapid development. Studies indicate that the third through eighth week of pregnancy is the most important period, as these weeks are when the neural tubes in the brain are developing. The American Pregnancy Association recommends avoiding pesticide exposure during this time. A recent study also indicated that exposure to a specific type of pesticide, organophosphates, may be associated with a higher risk of autism. Mostly phased out in home pest control products, organophosphates are still used in commercial applications. This study involved roughly 1,000 participants, a third of whom lived within a mile of a place where these pesticides were being used. Researchers found that those who lived in an area that had been sprayed had a 60% higher risk of having a child with autism spectrum disorder than those who did not. The largest risk seemed to be just before conception and during the first trimester. However, the researchers noted that there are a number of factors that may contribute to autism and that pesticide exposure alone may not be the cause. The mother’s age and health and the distance from freeways may also be significant factors. While caution is a good thing during pregnancy, particularly during the early months, completely foregoing pest control carries its own risks. 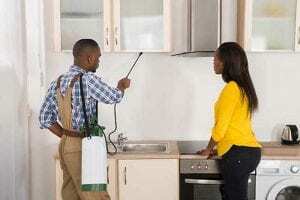 Infestations of pests that include fleas, mosquitoes and cockroaches can be far more dangerous to you and your growing baby than the pest control products used to destroy them. Mosquitoes can carry a wide array of contagions that include Zika, West Nile, Chikungunya, Dengue, and Malaria. While most of those are rare in the United States, both Zika and West Nile have been detected in the country. The Zika virus can be especially worrisome for women who are pregnant, as it is associated with certain birth defects. A number of individuals are allergic to cockroaches and may suffer respiratory issues when they are present. The Asthma and Allergy Foundation of America says that cockroach waste is a major trigger for asthma and nasal allergies. If you have other children in the house, it is very important to control their exposure to these sorts of allergens, especially if they have documented respiratory issues such as asthma. Flea infestations can occur if you have pets who go outside where fleas can hitch a ride back in their fur. Once inside, fleas may hide in carpets, on plush furniture, in bedding and in other areas. The small, itchy, raised bump their bites leave behind are more irritating than harmful, but scratching them can lead to infection. Fleas also, rarely, carry the bacteria that is responsible for the bubonic plague. Symptoms include fever, headache, weakness, fatigue and painfully swollen lymph nodes. Because of the risks associated with household pests, controlling them is important even during pregnancy. By carefully choosing pest control methods and getting a little help from others in your household, you can keep pests at bay while reducing the chances of dangerous pesticide exposure. Most home pest control, when used correctly, comes with only minimal risks. Some careful planning can assure that you stay safe and comfortable. Always read product labels when choosing a pesticide. Ensure that it is approved for its intended use. Never use products in ways other than indicated by label instructions. Research pest control options and choose the least toxic pest control available. If you use a professional service, experts say that you should contact your pest control company to let them know you are pregnant. Those who use integrated pest management techniques can use non-chemical options during the first few months. If chemical pesticides are still used, you can avoid exposure by leaving your house during treatment and keeping windows open when you return home. If your family uses DIY pest control treatments, have someone other than you apply them. 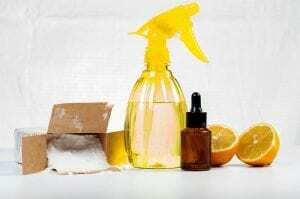 Chemicals should be applied sparingly and only where needed. This is safer than widespread spraying of pesticides. Remove all food, utensils, cooking tools and dishes from the area that is being treated. This includes areas such as cabinets and drawers. Keep these items out of the way until several hours after pesticide application. If pesticide is being sprayed outside, close the windows and stay indoors. This can keep pesticides from being drawn into the house and limit your exposure. If you garden and will be in an area where insecticide or weed killer has been applied, wear rubber gloves and clothing that covers your skin. This can limit the amount of pesticide you are exposed to. When gardening or enjoying outdoor recreation, it’s important to protect against mosquito bites, especially if you live in an area where mosquito-borne illnesses have been detected. A study on the effects of DEET insect repellent found that its daily use was not associated with an increase in birth defects or developmental problems. DEET-based mosquito repellents are sold at a number of concentrations. A higher concentration does not provide stronger protection – it protects for longer. For instance, a product with 6.65% DEET protects for around two hours while a product with 20% DEET protects for four hours. If you are concerned about DEET exposure, pick the product with the lowest concentration that will protect you for the span of time you expect to be outdoors. While there have been reported issues with people overexposed to DEET, using products as directed can eliminate this risk. Does someone in your family work with pesticides or work in any area that is exposed to them? This can include individuals who work for pest control companies, agricultural workers, and those who work near areas that are exposed to pesticides. You can minimize exposure by having them change out of their work clothes and wash them immediately once they return home, then showering to remove any additional residue. When faced with household pests, look for the least toxic way to eliminate the issue. Some chemicals are safe to use later in pregnancy. Again, be sure to always follow label instructions. If you are not sure whether a pesticide is safe, call the National Pesticide Information Center at 1-800-858-7378. This non-profit organization is a cooperative endeavor between the Environmental Protection Agency and Oregon State University. In some cases, repelling pests and taking action to avoid attracting them can go a long way toward keeping them out of your home. Cockroaches are attracted to food residue on dishes, crumbs on floors, and moisture sources such as water accumulating in the sink. Have someone help out with cleaning to keep up on materials that can attract them to the home. The American Chemical Society discovered that one old wives’ tale has merit: placing catnip around your home can repel cockroaches. Hedgeapples, the inedible fruit of the Osage orange tree, were also found to repel pests including cockroaches, mice, flies, and crickets. Cockroaches often enter the home via cardboard boxes and the bottoms of paper bags. To keep them out, remove these items after opening any packaging. Glue traps for cockroaches are a non-pesticide option. Typically made of cardboard, they have an adhesive material that traps the insects when they enter. These should be placed in the areas where roaches walk. However, some experts with professional pest control companies express concern that these options will not trap enough roaches to eliminate an infestation. Fruit flies are a common pest during warm weather. Keeping the kitchen sink dry between uses and using a sink stopper can reduce the number of fruit flies attracted to sink drains. Mosquitoes can be kept away from the home using commercial traps that use heat, light and carbon dioxide in combination to lure and trap them. Most of these traps are powered by propane, which is used to create heat and CO2. They will treat an area of about ¾ of an acre. Fleas can be controlled by pet repellents like Frontline or Advantage. These are applied once a month to make the animal unpalatable to fleas. While the manufacturers do not mention whether these are safe for humans, they do say that these medications are safe to use on pregnant and lactating pets. To be safe, have another family member apply the medication. Many people also swear by homemade flea traps made with soapy water. A pan is filled with water to which a drop of dish soap has been added to reduce surface tension. Then, a light is pointed toward the water surface overnight. Fleas are attracted to the light and drown in the water below. According to one tutorial, this method will eliminate 50 fleas per night. In pregnancy, there will be many situations where competing goods become apparent. With pest control, it is important to balance the risks of pesticide exposure with the risk associated with the pest itself. By researching options and ensuring that you pick the ones that provide the most benefit with the least risk, you can keep yourself and your child healthy throughout your pregnancy. Pests.org is dedicated to helping you protect your home and your family from pests and the diseases they carry. We provide the resources, reviews, and advice needed to make informed decisions and find the best solutions for pest control. Our reader-friendly guides offer comprehensive reviews whether you are looking for the most effective products on the market today or the best providers in your area. 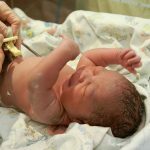 In the past, the common practice was to pass Dad the surgical scissors and have him perform a quick snip just before the newborn babe was whisked away to be cleaned, measured and dosed with vitamin K. Any delay in cord cutting was viewed as unnecessary in promoting general health for the baby or mother. However, recent research suggests that a delay of even three minutes can have a significant positive impact on infants.